Blog post by Deb Nicholson. Please email any comments on this entry to <deb@sfconservancy.org>. This is part of our ongoing series to highlight our generous matching donors. Keith Packard has been working in free software for more than thirty years and is a long-time contributor to Debian, X Windows and more recently the Linux graphics driver stack. Keith and several other outstanding individuals are joining Private Internet Access and a big anonymous donor in offering a total of $90K in matching funds to the Conservancy for our continued work to provide both a "back-office" for free software and a clear voice in favor of community-driven licensing and governance practices. You can join him and donate today! Deb: What's the best recent trend you've seen in free software? Keith: I've been excited to see how rapidly the free software communities I participate in have adopted strong codes of conduct. I feel like the tone of communication has become kinder and accepting. We've still got a long ways to go, but it feels like we've at least accepted that this change is necessary and good. Deb: What do you think non-profits are uniquely positioned to accomplish in free software? Keith: I'm afraid I'll have to be very US-specific with my answer as the US tax code colors how people within non-profit organizations work, even non profit organizations with an international scope. The free software non-profit organizations that I am involved in have operated under the 501(c)3 rules for public charities. These rules are designed for groups focused on charitable, scientific, educational and certain other purposes and require a strong commitment to the public good. For instance, X.org was able to operate under 501(c)3 rules only after demonstrating (to the US government) a many-year history of providing direct educational assistance to new and existing software developers through our conferences and other outreach programs. The goals of free software include allowing all people to control their computing environment and allowing people to teach, learn and share all of the software they use. An organization supporting free software for the public good is the best way I know of to defend and promote the essential software freedoms. "I'm so pleased to have been asked by Molly to participate in this fundraising drive; her vision of what we can do as a community is inspiring to all of us." Deb: Is there a free software project that you wish existed but (as far as you know) no one has started working on? Keith: One of my little quirks is that, even in 2018, I run my network infrastructure out of my own home (mostly email, git and web pages). I feel this offers me a better legal framework should someone want to seize any of my data, plus it keeps me from being subject to any corporate policies I might not like. My web site is published using ikiwiki, which works pretty well but is both overly complicated and missing some key features. I like the general plan -- write markdown, commit to git and publish the resulting web site. I don't like the markdown it uses; it's old and written in perl. I don't like how publication works -- you push source code to a git repository on the web server where a git hook runs to compile that source code into your web site. I recently packaged cmark-gfm for debian; that's the common mark to HTML conversion program that github uses for all of the markdown content that people publish there. It's fast and self-contained, but it doesn't generate whole web pages, just HTML fragments. What I'm looking for is a self-contained web site publication program that takes a collection of templates and a collection of common mark files and generates a whole web site from that on my laptop. Once the web site is complete and tested, I should be able to copy it to the web server unchanged where it can be served directly. Essentially, I'm interested in free software to help make running a simple web presence easier, more secure, and still look good so that people aren't stuck using commercial services where users are the product. Keith: Of course, I'm hopeful that Conservancy will continue to grow and spread the good news about free software. I expect to see many more member projects join. I'd love to see parallel organizations form supporting freedom in other areas of the arts and sciences -- everything from computer hardware to clothing design. I think those communities can learn much from what Conservancy has accomplished, and I hope we can learn from them as well. Keith: I'm so pleased to have been asked by Molly to participate in this fundraising drive; her vision of what we can do as a community is inspiring to all of us. Please take a minute to help Conservancy continue to spread the good news about free software and meet this exciting year-end match, today! 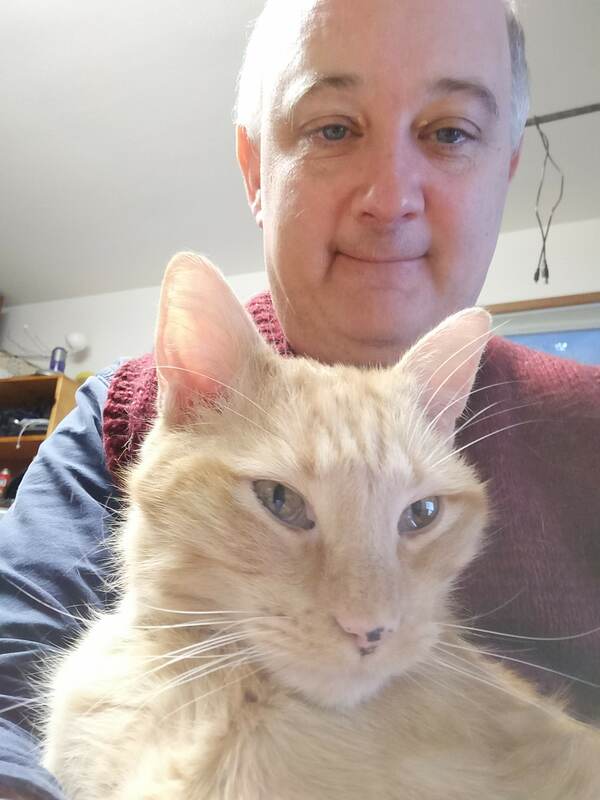 The picture of Keith with his cat is a selfie and is available under the CC BY-SA 4.0 license.